Solitaire, a Norman Rockwell painting , appeared on the cover of The Saturday Evening Post published August 19, 1950. This is yet another favorite of Rockwell collectors, a classic enduring image of the world Rockwell painted. An alternate title for this painting is Man in Bed Playing Solitaire. This painting was Rockwell's 264th overall out of 322 total paintings that were published on the cover of the Saturday Evening Post. Rockwell's career with the Post spanned 47 years, from his first cover illustration, Boy With Baby Carriage in 1916 to his last, Portrait of John F. Kennedy, in 1963. This was also the second cover for The Post in 1950. In 1950, there were four Norman Rockwell Saturday Evening Post covers published. The original oil on canvas painting, 27 x 25 inches or 68.5 x 63.5 cm, is part of a private collection. 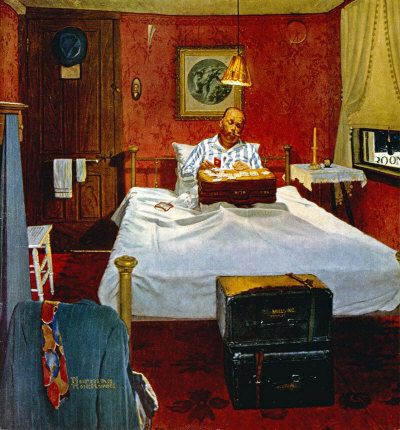 In this painting, Norman Rockwell shows us the niggt life of the typical traveling salesman. When one thinks of living a traveling lifestyle, this scene is not really the one conjured in the mind. Looking at this painting, we can see just how un-glamorousd that life can be. The inside of this hotel room seems somewhat outdated and neglected. The wallpaper is peeling, the curtains on the window are worn and the onlylight besides a candle on the nightstand is a naked incandescent bulb susp;ended from the ceiling. His sample cases are all stacked at the foot of the bed. He has hung his jacket on a chair and he is slowly re-pressing his pants by hanging them from the top drawer of the dresser. Solitaire was only one of 322 Norman Rockwell Saturday Evening Post covers; Here is the list of Norman Rockwell Saturday Evening Post cover illustrations. This fellow is pretty bored. Solitaire is not his only entertainment, though. Notice the flyswatter by his side. He can also amuse himself by swatting flies. I wonder if the swatter is included with room or provided by the patron. Do You Have A Great Story, Opinion Or Contribution About Solitaire?